Christmas wedding centerpieces add extra magic to your wedding decorations. Because of the cold weather, a Christmas wedding seems to be more personal and intimate with everyone huddling together to keep warm. 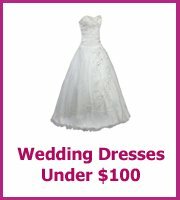 The obvious colors for a Christmas wedding are red, green, gold and silver but you need not be limited to these colors. There are other colors that you can use for a Christmas wedding and as long as the venue's decor and Christmas wedding centerpieces are coordinated then that would work well. A simple yet elegant Christmas wedding centerpiece comprises of white and red candles set on a bed of greenery. A 14" x 4" wooden tool box or container. Purchase 1-2" diameter dripless white candle and 2-2" diameter dripless red candles. Arrange the candles on the box making sure they are evenly distributed at different heights. 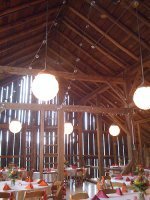 You can place the candles on candle holders or soup tin cans. After securing the candles, fill the gaps with water-soaked floral foams around after the tool box after lining it with cling wrap or any clear plastic. Insert greenery into the floral foam making sure that the candles are well integrated in the arrangement. You can use pine and fir leaves and whatever greenery you can find. Add a swirl of matt golden garland and some white aster for the final touch. An easier option is to buy potted poinsettias, wrap the container in a plain green wrapper then tie with a gold wired ribbon. 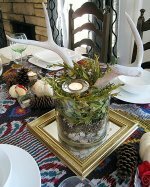 A Christmas wedding centerpiece need not break the bank. This simple centerpiece is so easy and inexpensive. All you need is a rectangular platter, ceramic or glass. Note that you can also use a tray as long as its width is not more than 4". The length could be anywhere between 16" to 24". Line the platter with silk or real magnolia leaves. You can add a dash of silver paint on the leaves or some silver glitters. Buy blue medium-sized Christmas balls. You can have the option of buying one shade or several shades of blue. Make sure you have enough decorative balls for the platter. Arrange the Christmas balls on the platter. Add some silver sprigs between the Christmas balls for the finishing touch. Another option for this color scheme is use a round platter that is big enough to hold a 4" diameter dripless silver pillar candle. Secure the pillar candle on the center of the round platter. 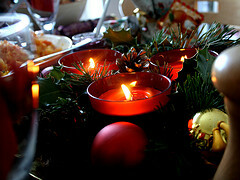 Arrange fir and pine leaves around the candle. Add a few blue sprigs on the arrangement and it’s done. Choose a white ceramic bowl or flower pot with a height of at least 4". Fill the bowl or pot with floral foam soaked in water. Insert white hydrangea blooms into the ceramic bowl or pot. Make sure your bowl could take in at least 3 large blooms. Add some white snaps and wax flower foliage on the flower arrangement and fill the gaps with gold Christmas ornaments on wire. 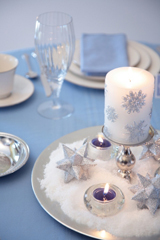 Add gold votive candles around the Christmas wedding centerpiece for a more festive and elegant finish. Another option for this white and gold motif is to use a golden urn for the container and use white gladiola for the flowers. For fillers, use green berries and fir leaves. Or you could use all the fantastic Christmas decorations that will be around! 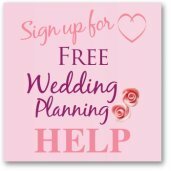 If you are holding your wedding reception at a large venue such as a hotel or function rooms you will find that they already have Christmas decorations everywhere. When I used to work in hotels we had our decorations up from the end of November! 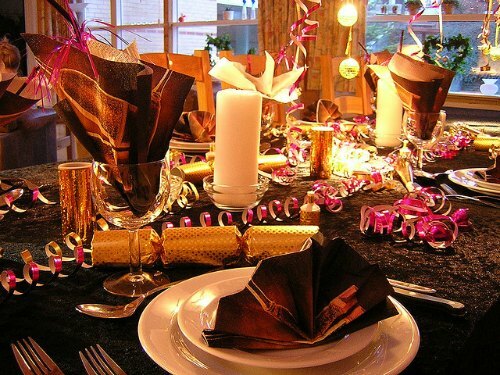 You can ask your venue if you can use their Christmas table decorations that they normally use on their party nights and save yourself a fortune. However do make sure you have seen what they look like - they may be awful. Also if your wedding is later in the Christmas party season then their decorations will have seen some partying and may look a bit tired. Again just check them out to make sure.